DENVER – The hole in the Thunder’s defense was at the three-point line throughout a blistering 40-point first quarter by the Denver Nuggets. Turned out that the Thunder’s comeback hopes would fall short that way too. After giving up 40, 32 and 32 points in the first three periods, the Thunder’s defense suddenly tightened up in the fourth quarter behind a grimy, scrappy effort by the second unit and scintillating performances by Paul George and Russell Westbrook down the stretch. With just 1.4 seconds left in regulation, the Thunder had allowed just 20 fourth quarter points. On an inbounds play, Nuggets guard Gary Harris relocated up to the right slot from the deep corner, and Nikola Jokic fired a rocket all the way across court, leading to the spot where Harris was headed. 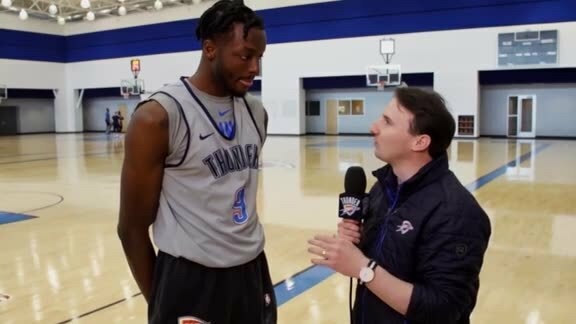 Despite a potential travel and five second call on Jokic and a possible offensive foul as Jerami Grant crashed to the ground in the lane, the ball found its way to Harris and then into the bottom of the net as the Thunder fell 127-124. Westbrook was caught in between two tough decisions – remain glued to Harris, or protect the paint in case of a lob. After all, the Nuggets’ initial actions on the play were created to get a player diving towards the basket for a lob. When Wilson Chandler barreled over Grant on his way to the rim, Westbrook had to freeze a second, knowing he was the only one left as a line of defense against an easy layup. The brilliant Jokic, who finished with 29 points, 13 rebounds and 14 assists, made an incredible one-handed pass and Westbrook sprinted out to Harris, getting centimeters away from blocking the shot. The tiny piece of the ball he got wasn’t enough. “What they were trying to get was a double curl for a lob, and we took those away, and obviously they improvised from there,” Donovan described. It was a heartbreaker for Billy Donovan’s club not just because of the way the team erased a 20-point deficit, including a 17-point disadvantage in the final frame. It was even more of a stomach punch because of what happened just one play earlier. Down 124-121 with 5.6 seconds to go, Grant patiently waited for Donovan’s side out of bounds play to develop, and George shook free for the catch on the left wing. The dynamic scorer attacked off the bounce with two dribbles going left, side stepped to get both feet just barely behind the three-point line and drained a game-tying jumper. It was a monumental moment for George, who finished the game with 43 points on a career-best 19 made field goals, an effort where he got hot early and stayed that way throughout the evening. Westbrook was clearly intentional about finding George at the start of the game, and given the way the Nuggets defended, it was the right strategy. At halftime, Westbrook had 13 assists, a career-best for a half, on his way to 21 total dimes on the night. It wasn’t just keeping teammates involved, Westbrook was making the right plays, reading and reacting to the defense’s openings as the Thunder shot 52 percent and scored 66 points in the paint. All of that offense wasn’t enough to make up for a dismal defensive performance in the first half, when Denver scored 72 points. The Thunder was falling a step or two behind the ball in pick and roll coverages, and the Nuggets were able to attack the heart of the paint – the worst possible place for the ball to get for a defense. The consequences were hard to swallow. In the first quarter alone, the Nuggets made 6-of-12 threes and by halftime Denver was 11-for-24 from behind the arc. That started to slow down in the third quarter, and Denver shot just 4-of-14 behind the arc in the second half, despite the obviously brutal one that dropped as time expired. The reason was a better effort by the Thunder in transition, where it held Denver to just 2 fast break points over the final 24 minutes of play, and none in the fourth quarter. With Andre Roberson injured for the season and Terrance Ferguson sidelined with illness in the first quarter, Donovan empowered Alex Abrines with 29 minutes off the bench. The Spaniard stepped up to the plate by scoring 13 points and staying solid defensively, even blocking two shots. Abrines was on the floor to start the fourth quarter, when he and his second unit mates Grant, Raymond Felton, Patrick Patterson and Josh Huestis chipped into the deficit by getting to the free throw line. Grant, who scored a season-high 18 points, was incredibly aggressive. By drawing three fouls in the first two minutes of the period, Grant helped the Thunder score with the clock stopped. By the time the starters checked back in, the Nuggets lead was only 10. Westbrook, who started 2-for-13 in this one, turned it around and went 5-for-5 after finally going to the free throw line for the first time in the game with 3:25 to go in the third quarter. The Thunder point guard was a major catalyst in the final minutes as he buried a pair of clutch three-pointers and attacked the rim to get a two-for-one that set up George’s game-tying three-pointer. Between those two All-Stars, the Thunder gave itself a chance to eke out a come-from-behind road win. Tonight in Denver, it just wasn’t meant to be.